A belated Happy Canada Day to all and a Happy 4th of July to all my American friends and readers. Hope you all enjoyed the long weekend. We stayed close to home and family and friends this weekend and did something that we don’t do enough of…explore in our own backyard. We took a drive to Hamilton, Ontario which is about an hour outside of Toronto. Hamilton is a port city on the western tip of Lake Ontario and on the Niagara Escarpment. The area is filled with beautiful hiking trails that lead to hidden gems such as Albion Falls. Shannon Kalahan and David Pasillas are both photographers/bloggers whose work I admire and follow. A couple of weeks ago they released their first collaborative effort, an ebook for the budding landscape photographer, Photography Duh! This isn’t your typical photography book which covers technical information, instead it’s a no-nonsense, common sense book of mistakes you should avoid and not just any mistake but mistakes that both Shannon and David have made. Truth be told as I was reading the book I have to admit I’ve made some of them myself. Now don’t get me wrong this book isn’t just about mistakes to avoid but there’s some great advice and instruction on things you should do. Shannon and David cover everything from how to keep your gear clean when out shooting; equipment you should have with you when out in the field (and not just camera gear); rules…when to break them and when not to and yes they do get into some of the juicy stuff that us photographers like to review every so often and such as exposure; light and editing. The fun thing about this book…yes I said fun…is it’s written a with a great sense of humour and a little bit of tongue in cheek. Frankly I wish they had written it before I had made some of these mistakes over the years. The book is available in Shannon’s store here and at $5.99 it’s a steal. There is nothing more relaxing then sitting on a dock in a The Muskoka Chair (aka The Adirondack chair…or vice versa), with a cup of coffee and a good book staring out at the lake. I spent the weekend in Muskoka with my husband celebrating our anniversary. It was a wonderful, relaxing couple of days spent by the lake and exploring the neighbouring small towns. The resort we stayed at was right on Lake Rosseau and of course my favourite time to shoot is at sunset so how could I resist this scene. Click on the image to view a high resolution version (it really does look better) or to Purchase a Print. When its cold and dreary outside there’s nothing better then to curl up with a good book and I did just that this past week thanks to the creative team at Dreamscapes. They’ve just launched 2 new ebooks that I think you’ll find useful. 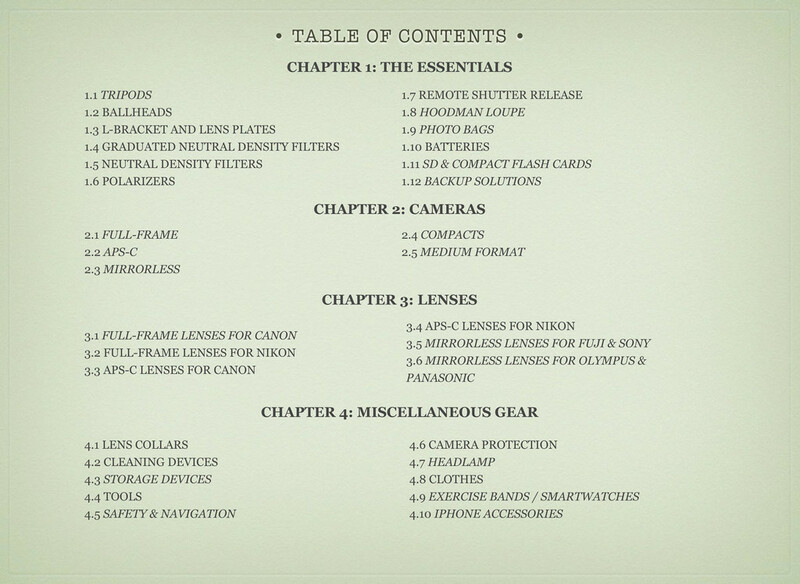 The first of these is The Complete Guide to Gear for the Landscape Photographer by Justin Reznick. This is the second edition of this book by Justin. I reviewed the first edition back when it first came out in November 2013. You can read that review here. The second has been updated with new reviews on equipment ranging from the essentials such as tripods, ballheads, shutter releases and bags to cameras and lenses, iPhone accessories. clothing and more. What I love about this book is that whether you shoot with a DSLR, a mirrorless camera, a compact camera or an iPhone Justin covers them all. Justin not only reviews the different brands of cameras and lenses (Canon, Nikon, Fuji, Sony, Panasonic and more) but he also shares his thoughts on the pros and cons of each. This 150 page ebook is jammed pack with great information and while I love finding out more about useful gear for me the best part of the book are the last 50 or so pages that are devoted to Photographer Interviews with the likes of Ian Plant, Tony Sweet, Jim Patterson and Jim Nilsen. 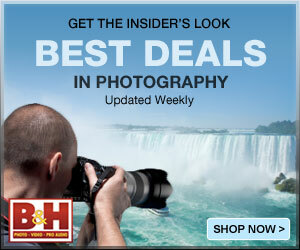 Each of these photographers (10 interviews in all) have their own special niche whether it be landscape, wildlife, infrared photography or desert photography and Justin gets them to share their own personal recommendations on what works for them and how they deal with the challenges that their own type of photography faces. The second book that I want to share with you is Master Flash Photography by Glenn Bartley. 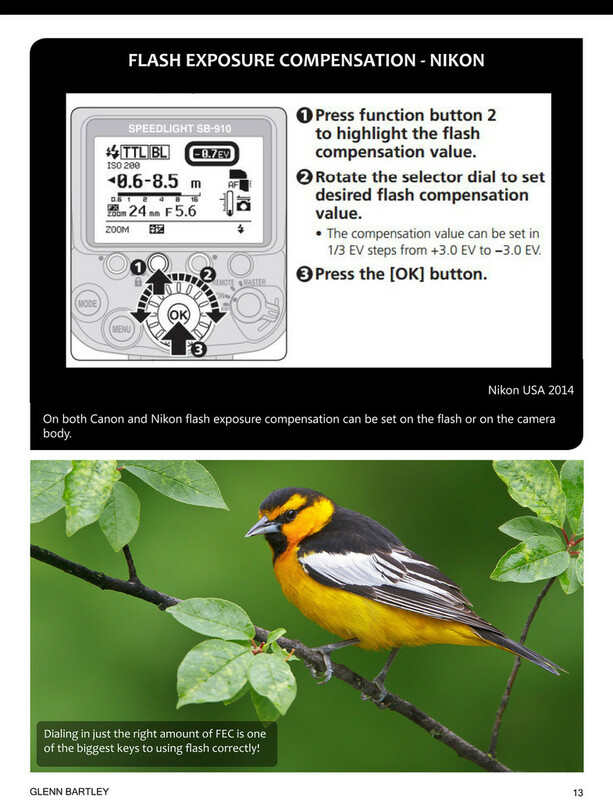 In this ebook Glenn takes the reader through the fundamentals of outdoor flash photography starting with a lesson on the basic controls of the flash. Now he calls this basic but its anything but. As I was reading through chapter 1 I realized how much I didn’t know about my flash (this is where I hang my head down in shame). While this book is touted for nature photographers I think the first 2 chapters, Basic Controls and Operations and In The Field are worth its weight in gold. This book gives you the foundation and knowledge to create better images in the field. Glenn covers how to use your flash in manual mode, ETTL mode, High Speed Sync Mode as well as using flash exposure compensation. Set by Step instructions along with diagrams accompany each topic. Learning how to properly use your flash in the field will allow you to shoot in low light, extend your shooting day, it will provide catch-light, fill light and punch to your images and it will freeze the action. The Complete Guide to for the Landscape Photographer is on sale for $9.95 (regularly $12.95) and Flash Simplified is on sale for only $16.95 until the end of January! (regularly $19.95) Click here to purchase.